Grace’s dream on the eve of her arrest once again emphasizes the importance of her bond with Mary Whitney—arguably the only source of lasting happiness in Grace’s life. Grace’s longing for a “real home” suggests that Jeremiah the peddler may have been right in characterizing Grace as a kind of wanderer. Grimm, Alexandra. "Alias Grace Chapter 40." LitCharts. LitCharts LLC, 7 Feb 2018. Web. 22 Apr 2019. Grimm, Alexandra. "Alias Grace Chapter 40." LitCharts LLC, February 7, 2018. 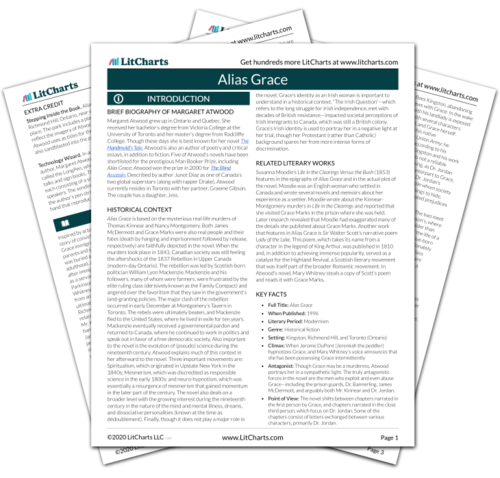 Retrieved April 22, 2019. https://www.litcharts.com/lit/alias-grace/chapter-40.